I’ve been a bit of a negligent blogger again for the last few weeks, and largely because there isn’t much to report since returning from Norway. I’ve been catching up on a fair bit of delayed “spring cleaning” — big house jobs that I’d avoided doing before our trip. And I’ve been plugging away at editing the 1200+ photos from our trip. I figure the easiest way to tackle it is by city, since our trip was divided up mainly by the cities we went to. Our first taste of Norway was in beautiful Tromsø, as I’ve mentioned already in previous posts. The Norwegians call it the ‘Paris of the North’ and while I’ve not been to Paris, I would argue that the claim is probably a bit of a stretch, although we enjoyed exploring this charming little city very much. It’s a quiet place, surrounded by mountains and mostly populated by tourists during the summer months. The city centre is situated on an island, with bridges connecting to the mainland and other islands. 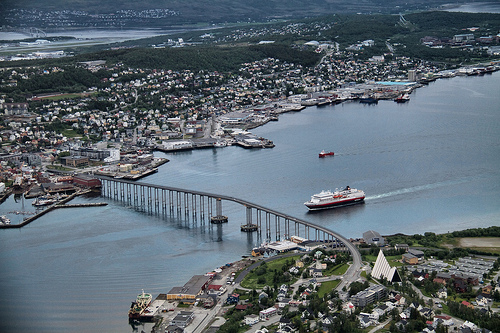 It is a major hub for the Hurtigruten ferry, the key commuter and tourism cruise ship line that operates along the Norwegian coast, all the way between Bergen in the south and Kirkenes in the very far north, which borders Russia. 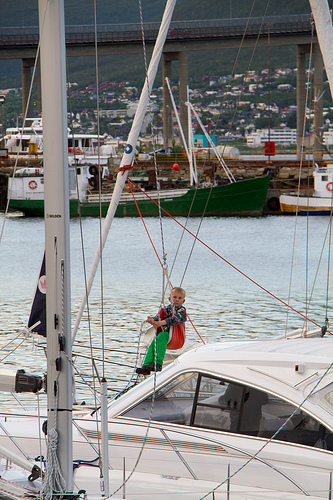 We kept seeing this little guy, swinging away on his sail boat, every time we walked by. It was like he lived in that swing. It was a great little city to get ourselves situated in, and get accustomed to the enormous prices of virtually everything. Be warned, if you ever plan to travel to Norway you better have saved your pennies, and if you want to enjoy yourself, you have to stop constantly converting things. It becomes just too depressing. To give you an idea, a beer at the pub runs roughly $16 to $20 Canadian. An “inexpensive” meal will easily run you $60 to $70 Canadian. In order to avoid budget heart attacks, Chris developed his own little economy of scale, with which he just measured everything in comparison to a cost of a beer. Virtually everyone speaks fluent English and we found that generally Norwegians are friendly and approachable. We checked out several small museums, including the Polstjerna Ship Museum, which gives you a chance to explore a preserved sealing vessel, inside and out, and learn about how Norway’s exploration heroes developed their Arctic climate coping skills, mainly from the Inuit peoples of Greenland. The early pole expeditions are mythically popular in Norwegian culture, and almost every city has some form of museum dedicated to these explorers, their boats, and their achievements. One money saving tip when travelling in Norway is that most hotels provide a very robust breakfast, including cereal, hard boiled eggs, yogurt, bread, cheese, vegetables like tomatoes, cucumbers and peppers, various types of creamed shrimp spreads (I tried these out and they were not really my cup of tea), often several types of pickled herring (also not for everyone but I’m proud to say I tried some several times) and usually smoked or cured salmon, along with jams, caviar and fish spreads for toast. Sometimes there was even sausages, bacon and beans. There were also usually bowls of apples and oranges and you could take a couple along with you. Because of our indulgent breakfasts — way more food than we usually start our day with at home — we found we didn’t really bother with lunches, and just ate one larger meal in the evenings. A highlight of our stay in Tromsø was a tour — one of the last to be given — of the Mack Brewery. While the Mack beers themselves aren’t exactly spectacular in our experience of craft beer, Mack is unique in that they are the world’s northernmost brewery, and northern Norwegians are highly loyal to the brand. 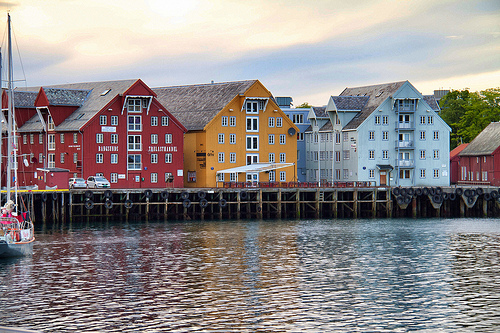 An entire city block of Tromsø is dedicated to the brewery, which was founded in 1877. Sadly, the brewery, which also manufactures coca-cola and sodas (a main source of revenue for the company), is moving out, at least mostly. 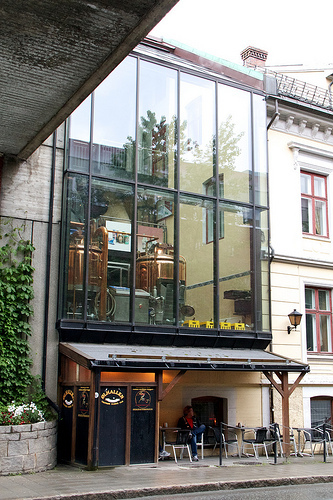 The micro brewery set up you see in the photo above will stay put, as will the Old Beer Hall (the pub located at street level in this photo), and they will continue to make small custom batches of beer here, but the main production is being relocated a few hours away from Tromsø. The remaining factory will be converted into artist lofts and studios. The other big highlight was being able to take the cable car up the mountain on the mainland, to see the city from above, during the midnight sun. As you can see, it was a little less than sunny, but it was a surreal experience all the same. We spent about an hour hanging out in the cute little chalet at the top of the mountain, and wandered about the mountain side a bit (in the misty rain). The cable car runs until 1 a.m. during midnight sun season, so by the time we got back downtown it was about 1:30 a.m., and Tromsø was just getting ready to start partying. Later we learned that Norwegians generally drink at home before they go out, to save cash. 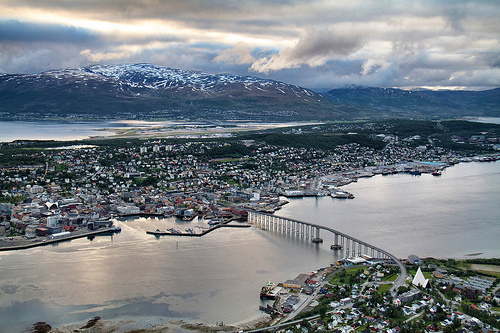 We also took a commuter ferry to the town of Harstad, south of Tromsø, for a day. It was another cute little town to check out, but there wasn’t much there to do. We mostly sat in the town square enjoying the beautiful sunshiny day, with the rest of the townspeople. A slideshow of all our photos from Tromsø is on Flickr, if you want to check it out. 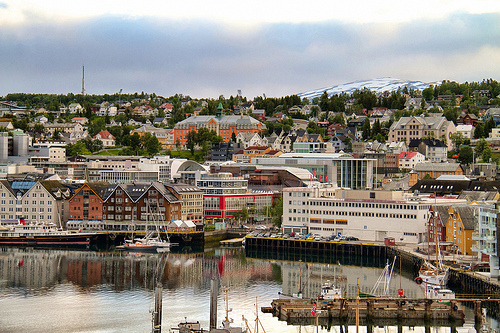 Next stop… Bergen!